COLOMBO, Sri-Lanka. — Despite being a young team comprised almost entirely of middle-schoolers and freshmen, the Lincoln School girls football team kicked off the season with high heads and spirited hearts. The NISSA games began almost immediately, and it didn’t take long to feel the void past teammates had left. There were a few games where we played really well, but as a fairly inexperienced team, we felt a lack of “gel” and as a result, didn’t place as well as we would have liked or had expected at the final tournament. Even so, we weren’t put down. In the next month and half, we came to each practice with bright smiles and an eagerness to learn, and in the process, developed not only our stamina and skills, but also our relationships with one another. More challenges were faced as two key players announced they couldn’t travel and while it was a setback, we kept moving forward. We were willing to do anything to ensure a successful SAISA. Some of us would even practice wearing extra clothing to prepare us for the heat and humidity awaiting us at Colombo, Sri Lanka, but the second we stepped out of the airplane, we laughed, knowing it had in no way done so. Thursday, April 19th came quickly, and SAISA was finally underway. We began the tournament strong, winning both our games on the first day 3-0. Our offense was an unstoppable force, shooting ball after ball and sending six of them to the back of the opponent’s net. Our defense, with our star goalie, Sarya, behind us, also displayed immense strength, with interrupting each run and deflecting every shot. At the end of the first day, we were feeling quite spirited, being the only team to have conceded zero goals; we were on our way to being one of the first seed teams into the semis. After drawing 0-0 with AISD, all we needed was a point from our fourth game against the home team, OSC, to progress to the semis. 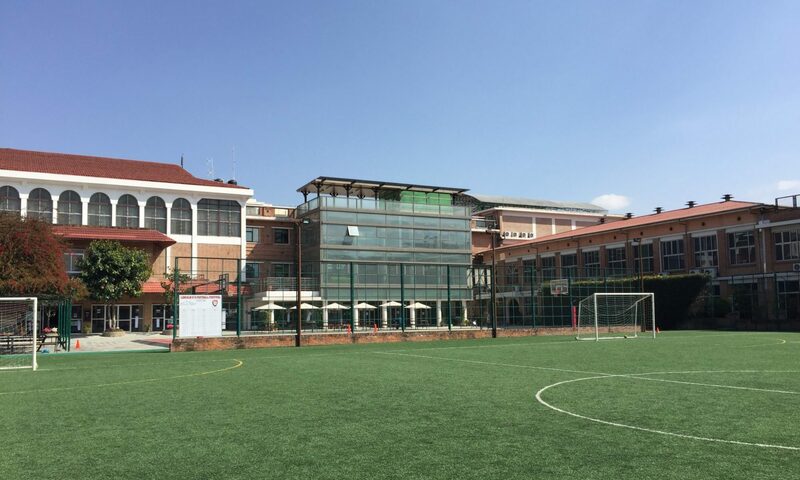 Their entire school was present cheering for their team, and it got to us. We starting making mistakes, and before the end of the first half, we had conceded a goal. We played significantly better in the second half; we sent shot after shot at their goal but unfortunately, none of them went in. Then things took a turn for the worst. A lightning storm broke, and not too long into it, our goalie got injured after colliding with another player. With the thunderstorm getting closer, there were shouts to get off the pitch, people directing us to the gym, cries for Sarya, and tears knowing we weren’t going to make it to the semis. At the end of the day, we all learned valuable lessons. Not just in regard to football, but life as well. Win some, lose some, but no matter what we’d provide unconditional support to each other. As Coach Anne put it, even the greatest teams can lose to anyone on a bad day. We knew what our mistakes were and made it our mission to correct it in our next game. We played our last game against ASB the following day and honestly, it was one of our best games in the entire season. We made strong, accurate passes, took shots when we could and even though we had to find a last minute, replacement goalie, we only conceded one goal. We finished the tournament in 6th place, which is amazing considering we scored six goals and only conceded two in our five matches. While it wasn’t what we had hoped for, I couldn’t be prouder of the selfless dedication, determination, support, and spirit that this group of girls displayed not only over SAISA, but the entire season. The sixth and seventh-grade middle school students celebrated another fantastic showcase of their passion-based learning projects. Each Exploratory class shared out videos and discussed their challenges and successes from this round of classes. Animators created some very impressive videos, especially considering the time they had to complete their projects. The woodworking group offered insight into the skills needed to construct their creative and functional designs. Our master chefs shared out the skills learned in the kitchen, and their motto, “If you can’t cut, you can’t cook.” Tasty samples from the talented chefs were enjoyed by all. 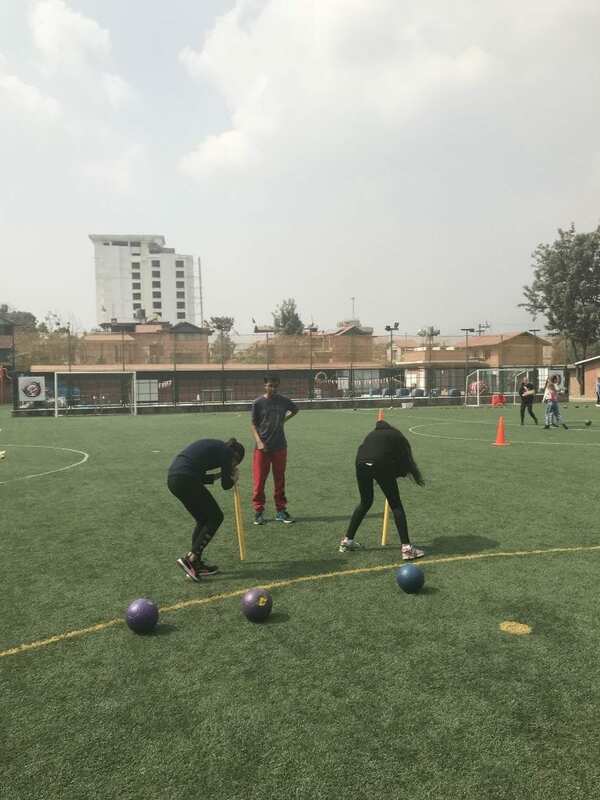 The Wacky Relay team used GoPro footage, with some highly skilled editing, to take the students through their obstacle course before all students were able to try it out for themselves. Thank you to the students and teachers for another exciting round of Exploratory learning and sharing. Student feedback demonstrated that this was the best showcase to date! The Wax Museum Comes Alive! On Friday, February 2nd, the eighth grade Innovation Lab class hosted an exciting interactive event in the Secondary Library: The Wax Museum Comes Alive! As part of their exploration of creativity, students were tasked to develop and become a unique, fictitious character. Each of these characters prepared a short soliloquy, which they performed when visitors approached them in the Wax Museum. It was a fun, lively event — thank you to everyone who came to visit and played along! Our SAISA Art program, “Kathmandu: Then & Now,” was a huge success this year. 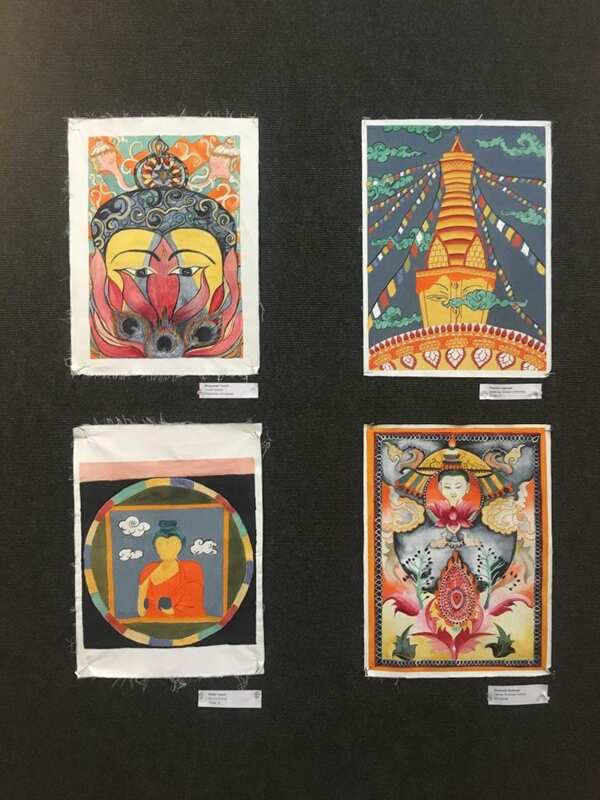 Featuring the rich artistic traditions of the Kathmandu Valley, students were exposed to an array of traditional and contemporary art forms in the local community. Five prominent Nepali artists of various disciplines led three-day workshops with 43 students from six SAISA schools. Naresh Shakya, a talented wood carver, who has worked on several UNESCO world heritage sites around Nepal, led a traditional wood carving workshop. Sudarshan Suwal taught Thangka painting. He is one of the only professional Thangka painters who continues to follow the traditional process of grinding his own pigments from natural minerals. Vijay Maharjan, a contemporary sculptor, led a casting workshop, where students learned how to cast objects and body parts with plaster and alginate. 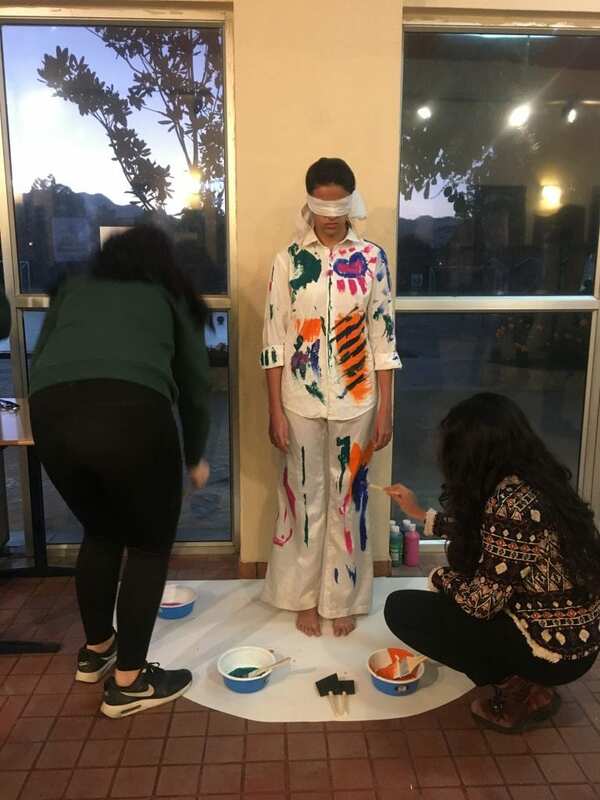 Mahima Singh, a performance artist and teacher, led a performance art and installation workshop, where students were pushed to develop a strong concept, think critically, and experiment with ways the viewer could interact with their art. Lastly, Sattya Media Arts Collective, a resource center for artists, filmmakers, photographers, activists, and other creative types in Nepal, led a mural painting and public art workshop. Students collaborated on a mural design inspired by words and images that represent their impressions of Kathmandu. They painted the mural together over the course of two days. On Sunday evening, students exhibited their projects in our SAISA Art exhibition. The Lincoln community was invited to peruse the gallery and interact with the artwork, as well as view some performance art in the theater. The culmination of student work was very impressive, thanks to our professional guest artists and the entire team who helped make the event a success. The seventh grade students participated in a writing workshop instructed by visiting author, Gennifer Choldenko. Students were challenged to use their five senses in their writing to engage the audience in descriptions of chewing gum, home, and the topic of shoes. The seemingly simple topics led to dynamic story telling and interesting perspective taking! It was a joy to see many students share their creative, funny, and emotional writing. Students also had time to ask the Mrs. Choldenko questions about the revision and publishing process. Way to go seventh grade writing warriors! Olympian Conducts Clinic for Lincoln Swimmers! Our Snow Leopard club swimmers had another awesome experience with Lysi Halkides – a Greek Olympic swimmer – conducting a stroke, turn, dive and tactics clinic at our school pool. Lysi, once ranked in the world’s top 20 in the 400 IM, and a participant in the London Olympcs 2012, was able to pass on a great deal of knowledge and experience to our aspiring swimmers. 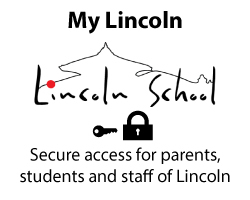 Lincoln Swimmers Shatter School & SAISA Records in Muscat! MUSCAT, Oman. — Lincoln School’s swim team took Muscat by storm over the weekend, with a 3rd place overall finish, 12 SAISA record-breaking performances, over 40 school records, and 23 gold medals. Our girls team finished second overall, and as champions in the 10-12 and 15-19 age group categories. Isabella handily broke the Lincoln School 50 freestyle record with a 30.11, and set SAISA records in the 100 freestyle (1:06.1), 200 freestyle, and 100 butterfly events for the 10-12 girls age bracket. Izzy set school records in the 50 breast, 100 IM, 200 IM, 100 back, and 100 breast, and Ashwini finished third in the 50 and 100 butterfly, beating her own personal bests by several seconds each. Our other 10-12 girls also greatly improved on their previous performances. Tisa added an incredible six (100 free, 200 free, 100 breast, 200 breast, 100 IM, 200 IM) 13-14 girls SAISA records to her already impressive resumé, including an outstanding swim in the 200 breast with a time of 2:56.34, smashing the previous SAISA record of 3:09.87, making her the fastest 200 female breaststroker at the meet for all age categories. Niamh made finals for all of her events, and placed third in a highly competitive 100 breaststroke race with a personal best time of 1:24.86. For the 15-19 girls, Oshina now holds a new 200 backstroke school record, and our girls – Niharika, Oshina, Akshara and Ayushma – destroyed the school and SAISA record for the 200 medley relay, then fought their way to more gold in the 400 freestyle relay with a time of 4:34.24. All these girls made finals in their events, with Niharika earning silver in the 100 breaststroke. Our boys also finished second overall, with a first place win in the 15-19 category. For the 10-12 boys, Atreya finished 4th in the 50 freestyle and 100 freestyle, with a 5th place finish and personal best time of 36.63 in his 50 butterfly race. All of our of our other 10-12 boys swam 200s of breaststroke, butterfly, or IM in the 13-14 age bracket, hugely improving their own personal best times. In the 13-14 bracket, Alex snagged a “Phelpian” 7 gold medals, including an incredible 25.60 50 freestyle race to break his own school record, as well as setting 13-14 boys SAISA records in the 50 free, 100 free (56.38), 100 backstroke(1:04.5), and 200 free (2:07), and new school records in the 100 IM, 200 backstroke, and 50 butterfly. Our 15-19 boys – Ugyen, Jazz, Dane and Tomas – set school records in the 200 freestyle and 200 medley relays, and obliterated the SAISA record in the 400 freestyle relay with a time of 3:57.32. Jazz garnered new school records in the 200 freestyle, and 100 and 200 IMs, while Ugyen broke 15-19 age group school records in the 50 butterfly, 100 butterfly, 50 freestyle, 100 freestyle, and 100 breaststroke. Every single Lincoln swimmer captured personal best times, and several coaches from other schools approached Lincoln ‘s coaches to compliment our team’s spirit, compassion, and sportsmanship. Although the outcomes of this year’s SAISA swimming championships speak for themselves, the process – the base of the “success iceberg” – is what these swimmer’s should be most proud of. They trained incredibly hard and their attitude, as well as their skills, earned the respect of everyone around them.